Wow...In a blink of an eye, the holidays are almost over. I have one more Christmas card for you that's really quick and easy to make, just in case you need to send out just one more card. Other Products: White Pearl Metallic Cardstock, Pink Pearl Metallic Cardstock, Silver Mirror Cardstock, Silver Pearl Cardstock, VersaMark, Silver Embossing Powder, Silver Glass, Crystal Embellishments, Big Shot, Misti, Embossalicious Holly Embossing Folder, dimensional tape, Hot Glue Gun. Instructions: Card is 6” x 6”. Cut a piece of cardstock 12” x 6”, score at 6” and fold in half for the tent fold base. Cut another piece of white pearl cardstock 5 7/8” x 5 7/8” and emboss with the holly folder. Cut a mat layer of silver mirror cardstock 5” x 5” and a mat layer in pink at 4 1/2” x 4 1/2”. The last layer is a 4” x 4” piece of white pearl cardstock that is also embossed. Adhere the large white mat to the base with dries clear adhesive. Adhere the next three layers together and then adhere them to the card base with dimensional tape. Stamp the Sparkling Poinsettia twice with VersaMark on white pearl cardstock and heat emboss with silver embossing powder. Diecut using the coordinating die and shape the two largest petals with the deluxe flower shaping kit. Sponge the petals with dries clear adhesive and sprinkle with Rajni Chawla’s Crystal Clear. Adhere the two petals together making sure to offset them. Add dries clear to the center and add the silver glass. 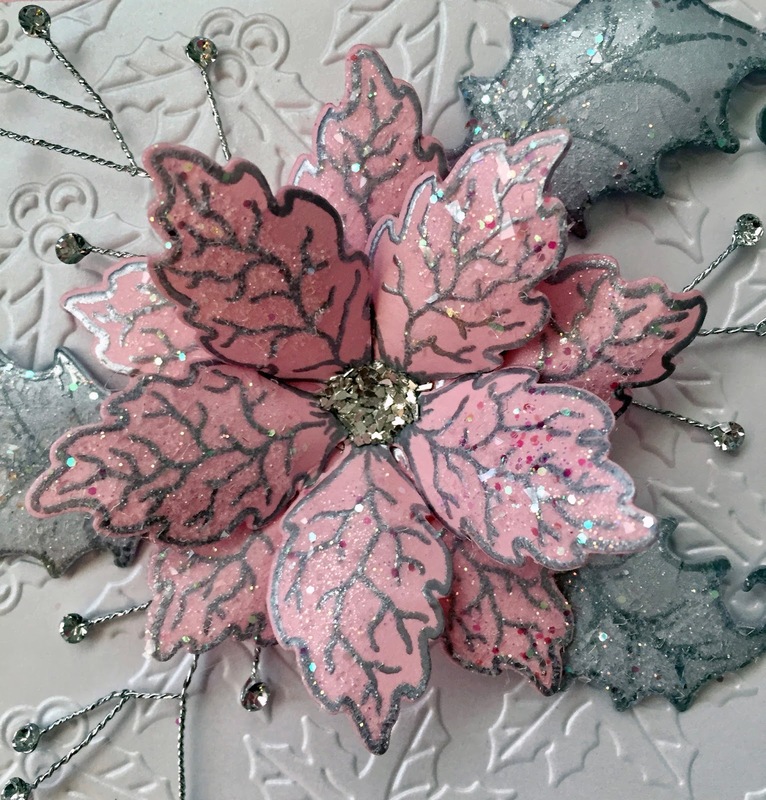 Stamp the leaves from the Large Sparkling Poinsettia stamp set with VersaMark on silver pearl cardstock. Heat emboss with silver embossing powder, diecut using the coordinating die and shape. Sponge the leaves with dries clear and sprinkle with Crystal Clear. 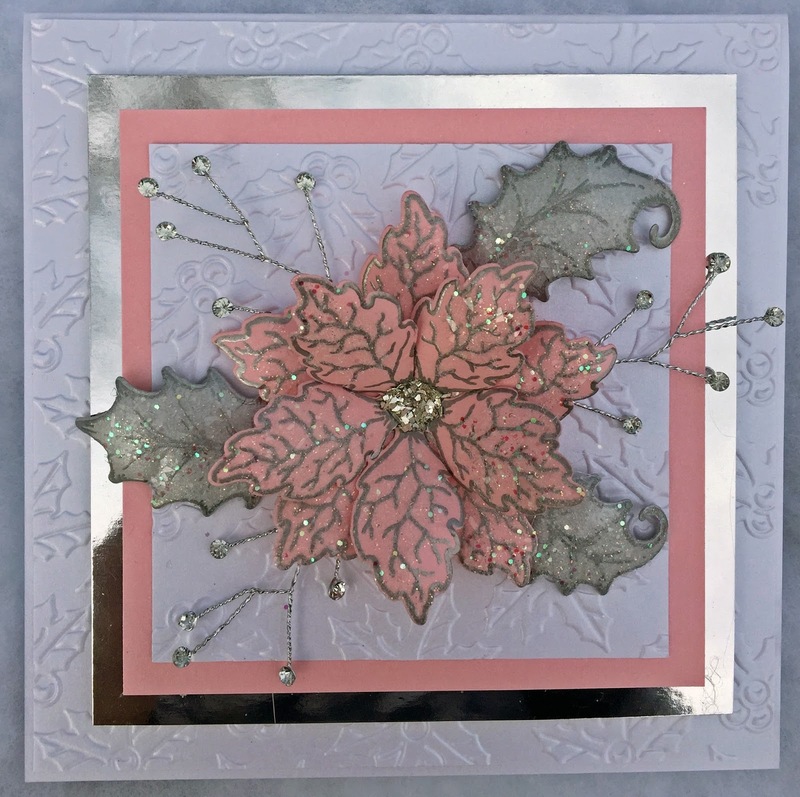 Adhere the poinsettia, leaves and crystal embellishments to the center of the card as shown. good health, love, happiness and many blessings! Have a beautiful day today and a beautiful year ahead! This is just lovely. Loving your poinsettia! Thank you so much Glenda! Where are the silver crystal embellishments from? Hi Tracie. I had picked them up at the Scrapbook Expo last summer. They were just thrown in a bin and wish I had gotten more. I’m on the hunt to see if I can find them on-line. I’ll let you know if I do. This beautiful card has such a sophisticated and elegant style...it's the colors that have made this card grab my attention. Very different and so interesting. Well done! Thank you so much Martie! Beautiful Janet! I love the pink and silver poinsettia!! Heartfelt Creations - Post It!